Shio ramen literally translates to salt ramen and that means that the broth is lightly flavored with ingredients that are highlighted by a tinge of salt. To be honest, it reminds me of good chicken broth without the earthiness of strong aromatics but has a rounded savoury flavor. I wish I can explain it better but it really is just ramen with a nicely balanced light-salted broth. This broth changes just a bit with every shop hence some would have a shio broth with a fishier taste and there are also tonkotsu shio ramen. 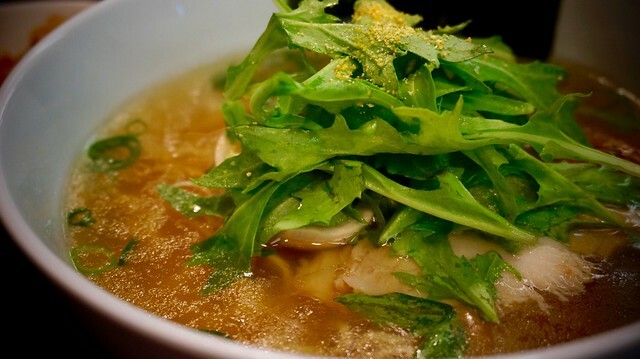 For Sokyo, their shio ramen has a hint of yuzu, a nice zing that livens up the broth. The yuzu was quite unexpected. I haven’t had ramen with yuzu so my face lit up when I saw it on the menu and ordered it right away. Sokyo’s yuzu shio ramen comes with thin noodles, charred nori, braised pork cheeks, menma, and some rocket leaves on top. The combination sounds fancy for a b-kyuu gourmet dish but as my friend T and I were talking about over dinner, ramen outside of Japan is too sophisticated for street food fare. 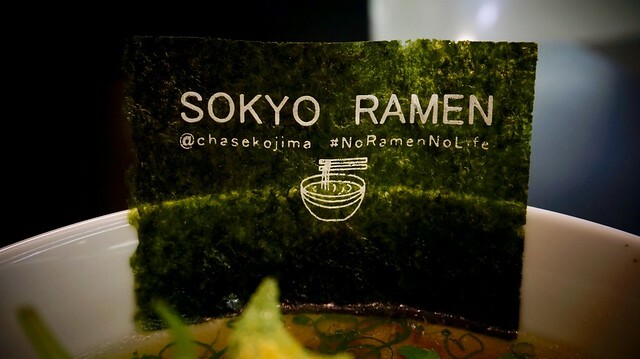 In this case, this ramen is also tied to hatted restaurant Sokyo, which understandbly has a reputation to keep. Hence, this ramen costs $16. Too steep for my ramen tastes but for once, it was actually quite worth it. The broth was silky and wonderful. I expected the light flavor but the yuzu lifted the broth enough to tease my palate. Like a light tickle of citrus that makes me giggle with every slurp. The yuzu didn’t overpower the broth which was great because the broth was still well balanced enough for me to enjoy sipping it to the very last drop. The thin noodles was a plus as I love my ramen noodles thin. The rocket leaves on top was like a light salad that matched with the broth which was like a soupy vinaigrette dressing. The pork cheeks were soft but it wasn’t spectacular. As the only Sokyo ramen that served char siu, I expected more but I guess in the spirit of ‘lightness’, even the char siu had a light flavor. Apart from the broth, what surprised me was the menma, the fermented bamboo which has always been a hit or miss for me. Unlike some menma that tastes like it was fermented in fuel, the menma in this ramen was crunchy and sweet. All in all, Sokyo’s Yuzu Shio Ramen was a comforting bowl, one that I needed after a stressful month. Given that this shio ramen didn’t disappoint, I planned for my next bowl. This time, I’m betting on the tantanmen which is my favorite ramen. I also had karaage with my ramen which was nice since it also had that yuzu finish. It was a nice tangy lunch that woke my senses on a dreary day. Now, I’m finding another reason to get back here while this pop-up shop lasts. 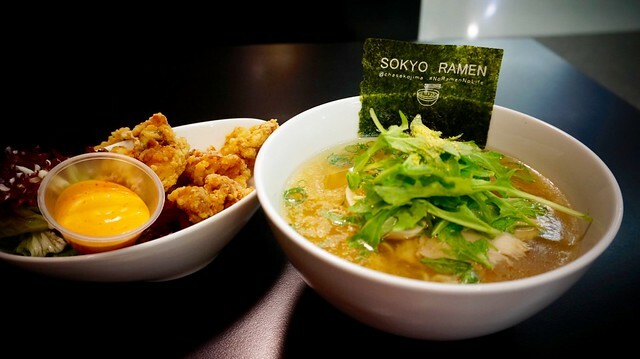 Sokyo Ramen will be at The Star until November 29. Until then, I’ll make sure that I’ve tried every bowl Chase Kojima has to offer.